Since late September, we’ve been experiencing a volatile stock market. The S&P 500 has fallen 9.61% from its high, the Dow Jones Industrial Average is off by 8.69% and the Nasdaq has swooned by 14.7%. Although the timing was anyone’s guess, this volatility didn’t come as a complete surprise to us. In these email notes, we’ve been pouring cold water on the market for over a year. However, most investors that we work with need an equity allocation in their portfolios for the long-term growth potential required to maintain purchasing power (keep-up with inflation). Equities are an extremely volatile asset class. 2017, with its low volatility, was an anomaly. What we are experiencing now is normal. 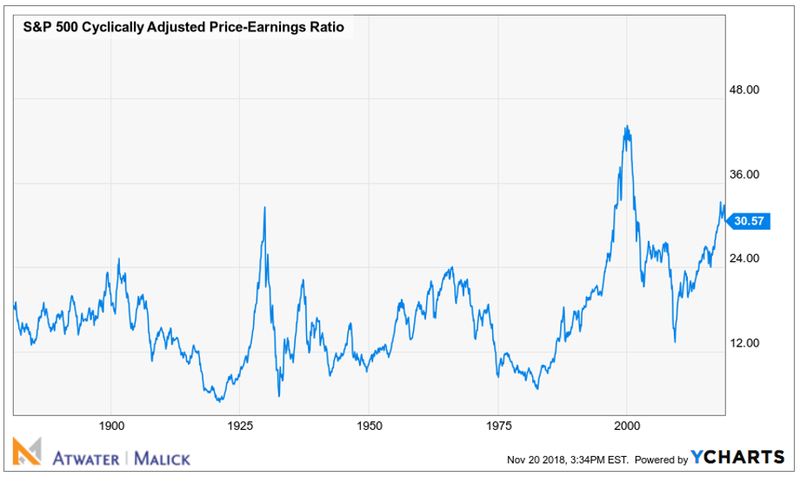 Stocks are overvalued, as indicated by many valuation metrics, including the 10-year cyclically adjusted price-to-earnings ratio below. Certain pockets of the market, such as large cap tech, are even more overvalued but they have been so for a couple of years. You can’t time the stock market. It’s impossible. Although you can’t time the market, you can properly construct portfolios to achieve individual client goals, which is what we do. We believe we have an appropriate stock and bond mix in place for each of our clients. This stock / bond balance reduces volatility, particularly in this most recent drop as interest rates are again falling (when interest rates fall, bonds prices rise), offsetting some stock losses. 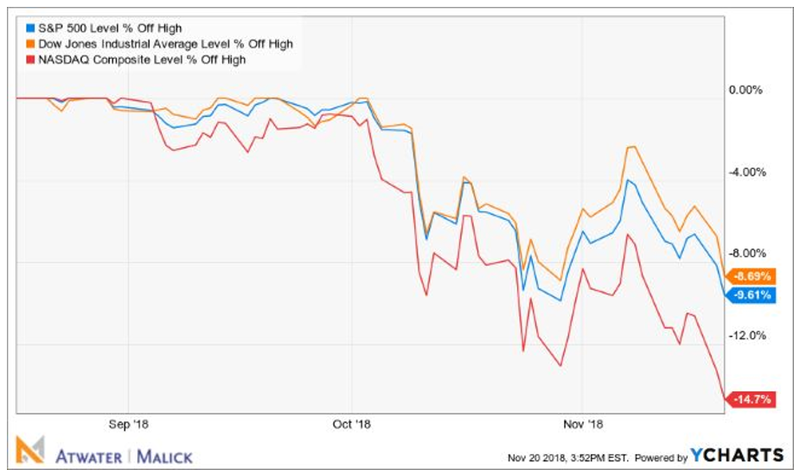 We focus on more value-oriented stocks that pay a dividend and have a reasonable valuation and we have a “safety-first” bond approach, both of which have limited volatility, while not entirely eliminating it. Investing has been “easy” for a few years now. Buying into fairytale stocks and asset classes led to immediate and then sustained gains. This is changing (and that change might be sustained this time). Investing isn’t “easy” or even “fun.” It’s a slog. Sticking to a strong discipline like we employ is the best long-term answer. We understand that times like now can be stressful and, therefore, we are available to discuss your situation. And, if you know of friends, family or colleagues that need a tried-and-true investment approach, please feel free to share this with them.